You may not believe this, but we can look out of our house on Christmas morning and see people swimming in the cold, cold water just a few miles from the place where the English Channel meets the Atlantic Ocean. I’m inclined to think that they’re mad, but I do know that they are part of a very old tradition. Every Christmas Day, since 1864, in Hyde Park the members of the Serpentine Swimming Club have competed in a Christmas day swimming race. J. M. Barrie was a patron on the race and he gave the club a trophy, now known as the Peter Pan Cup. 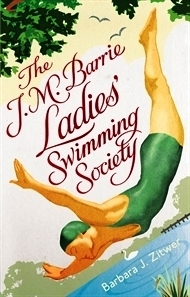 That’s why, when I first read the title ‘The J. M. Barrie Ladies’ Swimming Society’, it seemed completely natural and right. A book that really had to be. And I am happy to be able to report that the story inside is completely natural and right. It begins in New York. Joey is an architect, busy climbing the career ladder and sharing her life with Tink, a twenty-pound dog with very firm views on route selection. I was inclined to like Joey, even before I discovered our dogs had a great deal in common. But I did wonder if she needed something more in her life. It came when Joey had to step in at the last minute to make a major presentation. She didn’t want to do it but she knew that she had to do it, that she had more knowledge of the project than anyone else. Her professionalism, and her passion for the project, carried her through and she won the contract for her firm. And then Joey – and Tink – had to travel to England, to the Cotswolds. She was to oversee the restoration of Stanway House, the stately home that inspired J.M. Barrie to write Peter Pan. It was a wonderful opportunity. Joey could visit her best friend, who had married an Englishman and was raising a family in London, and then she could make sure that a restoration that she really cared about was done as it should be. But things when wrong. Sometimes friends’ lives move in different directions and they don’t understand each other as well as they think. And sometimes locals have their own ideas about what should be done, and they don’t take to experts with ideas of their own. The caretaker, a young widower with a teenage daughter, did a wonderful job, and he so clearly loved the house, but he was a particular problem. Joey had a lot to learn. About friendship. About communities. About what the really important things in life are. And that’s where The J. M. Barrie Ladies’ Swimming Society came in: a group of elderly ladies who came together to swim in the pond at Stanway House. Old friends who had lived very different lives; who had all lived, loved and lost; who celebrated life’s high times together and who supported each other through the low times. The J. M. Barrie Ladies’ Swimming Society lit up the story, and they helped Joey to understand what she should do, how she should live her life. The story is lovely, and Barbara J. Zwiter balances different plot strands and different themes beautifully. It was clear, even before I read her explanatory afterword, that she cared so much about her subject matter. Not quite perfect – the pacing is a little uneven and some times there was more explanation than I needed – but still lovely. The characters rang true: I believed in each one, in their psychology, in their relationships, and in the way that they evolved. There were moments when things became a little predictable, but it really didn’t matter. Because there were a few unexpected twists and, more importantly, everything that happened rang true. I loved Joey’s story, and the spirit of The J. M. Barrie Ladies’ Swimming Society made it even more wonderful. And I should end with the ending – it’s perfect! I have added it to my reading list! That’s great – I hope you enjoy it as much as I did. This sounds right up my swimming pool! I swim, although not in the sea on Christmas Day (but have been asked) and the tale sounds so gentle. I love the cover, so it might find its way into my reading piles! The title! The cover! So enticing. Your review makes it sound even more charming and irresistible. I love the books you read – I just wish my library carried more of them. This does sound lovely and I adore the cover. I’ll definitely keep an eye out for this one! This sounds lovely and your review brings it to life, I have seen it in the bookshop a couple of times and I am very attracted by the cover.